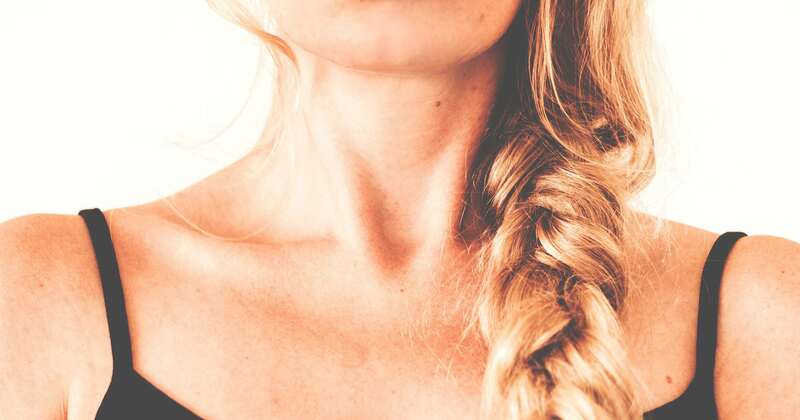 How to get rid of a double chin without surgery ? A double chin is an imperfection which troubles many people. Double chins can be genetic, linked to ageing or weight gain. – Skin, the sagging of the skin. – Muscles ,muscle weakness and muscular flaccidity, notably in the platysmal muscle. – Fat and excessive adipose tissues. 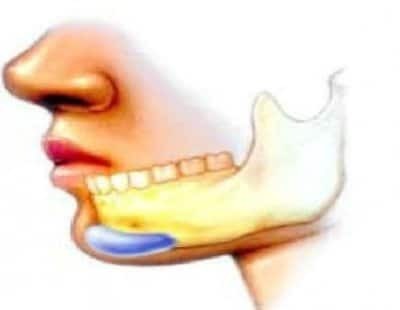 – Bones, notably the hypoprojection of the chin or ‘weak chin’. – The sub-mandible salivary gland. This often droops and is rarely hypertrophic. These factors in combination give the overall impression of a double chin, but excess fat is often, if not always present. 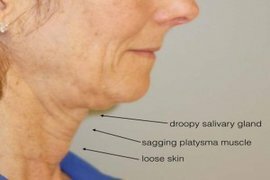 Excessive fullness around the chin and the neck gives the impression of a second chin with loss of definition of the jaw line, and it can be very ageing. 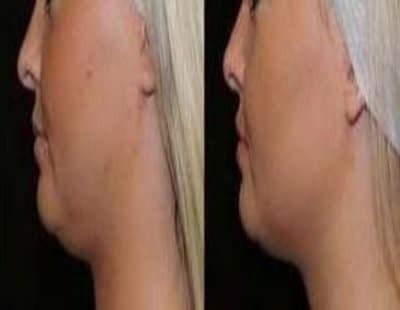 - Chin and lower jaw are well drawn, the neck is thin and below the chin there is no excess fat.. (Picture a). 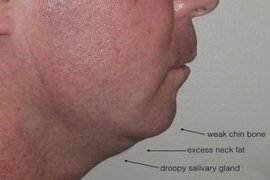 - The chin is hypoprojected , mandibular line is poorly designed and under the chin there is excess fat. (Picture b). This patient illustrates all the factors. 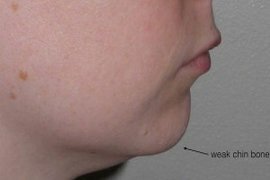 This patient illustrates the combination of excess fat, a drooping submandible gland and a weak chin. This patient shows sagging skin and muscles, and a dropping sub mandible gland. This young patient illustrates the combination of a weak chin and excess fat. Hyaluronic acid is indicated in case of hypoprojection of the chin. 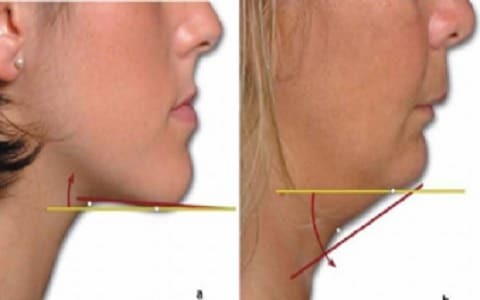 By projecting the chin the mandibular line is drawn, the profile is improved and traction is exerted on the anterior part of the neck which reduces the double chin. Cryolipolysis is used to treat excess fat at this level. 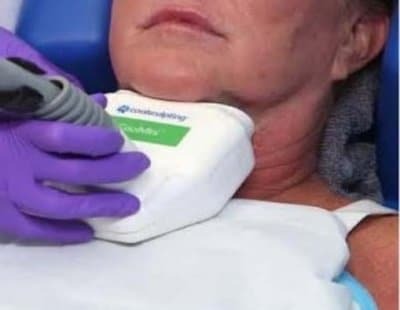 There is a handpiece specially designed for double chin that in one sitting reduces the thickness of this area by 30-50%. A second session may be necessary in some cases. Ulthera also acts on the fatty tissue. This is possible due to the single-point ultrasound focus, at which point the energy is so high that the fat is 'burnt'. One session is enough. Personally I find that the results are inconsistent and that the technique is expensive, it is necessary to discuss well with the patient pros and cons. 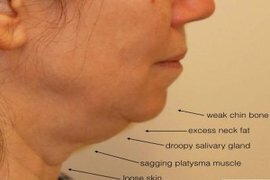 Fat excess in the double chin is the only indication of these injections. Two to four injection sessions are required for optimal results. 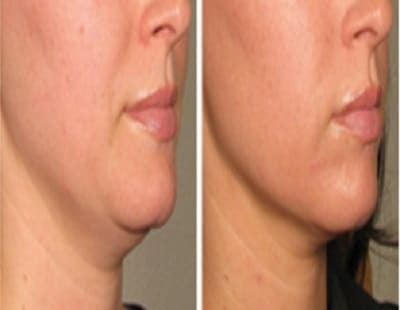 Double chin reduction, great result. Thank you again Doctor Romano. I thank Dr Romano for her listening ability, her availability and more than everything, the result. I had a double chin that was very displeasing, I didn’t dare take pictures anymore, the treatment has been efficient, I’m delighted. I consulted many times with Dr Romano, the last consultation was for my double chin. Doctor Romano greatly improved it, the result is beyond my expectations (she had told me of an average result that still interested me). Thank you again. The obtained results are remarkable. I’m extremely satisfied with the quality of her work. Doctor Romano has reduced my double chin, congratulations.